Popular songs about the State of California, dating from the Gold Rush through the vaudeville era, are celebrated in the new exhibit Singing the Golden State, which runs through December 7, 2012 at The Society of California Pioneers, 300 Fourth Street, San Francisco. 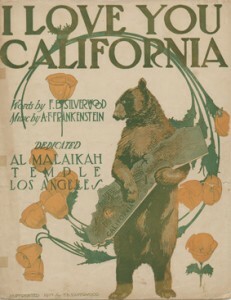 The show spotlights graphically striking sheet-music covers published from 1849 through the 1930s, along with other printed materials, sound recordings, instruments, and memorabilia relating to California and its early musical life. Singing the Golden State draws from two exceptional archives: the Frederick Sherman Collection of The Society of California Pioneers and the private collection of James M. Keller, the exhibit’s curator. For this exhibit, Keller has been assisted by two members of the Society’s staff: Director of Library and Archives Patricia L. Keats and Exhibitions and Education Coordinator Tim Evans. The exhibit, which occupies both floors of The Society of California Pioneers’ museum space, also includes a generous sampling of sound recordings, from the 1910s and ’20s, of selected songs that are on display. On the first floor of the exhibit, visitors hear early audio tracks privately via MP3 players, while on the second floor a still wider selection of California songs is broadcast through a high-quality audio system.